How will your life change if your candidate loses? 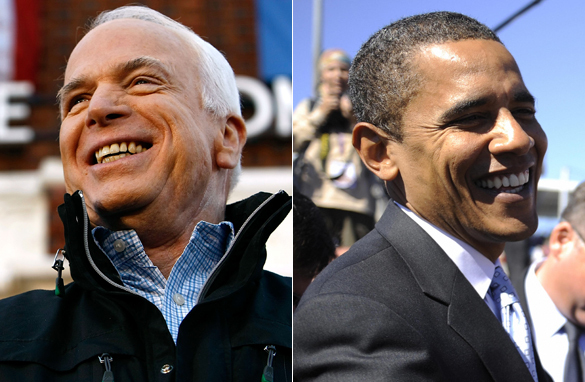 Voters have a distinct choice between John McCain and Barack Obama in this presidential race– two very different approaches to arguably the most serious set of challenges we have faced in a hundred years. Whoever wins will have his hands full. But what about the rest of us? Our part is finished after we cast our ballots on November 4th, and after all the votes have been tallied, the excitement will be over. Most of us will be happy with the outcome, but if you look at the latest polls, a good number of us won't be rushing to embrace the new leadership. Either way a new administration means new faces at the top and new policies that will trickle down to all of us little people. The form of that trickle will determine the way a lot of our lives will go in the future. Here’s my question to you: How will your life change if your candidate loses? If McCain loses, what’s next for Palin? Former Secretary of State Lawrence Eagleburger - a Republican and supporter of John McCain - told national public radio yesterday that Alaska governor Sarah Palin is not prepared to take over the job of President if she had to. He said, "I devoutly hope that [she] would never be tested." But the fact is that if some people in the Republican Party get their way, she could be tested one day. Should John McCain lose the race for the White House, you can bet your last dollar this moose huntin', gun totin', pro-life hockey mom will not fade from the political spotlight. She's a huge hit with a group of social conservatives who embrace her values and see her as a fresh face for a divided party… to them, a 2012 Palin run for President may be on the horizon. Watch: Cafferty: What's next for Palin? But a lot of other people feel quite differently. Sarah Palin quickly became a national joke for her lack of experience, failure to grasp the issues and inability to handle herself with the media - especially those awful interviews she did with Katie Couric. Recently she's gone off script and off message on the campaign, angering several of McCain 's campaign advisers. She's been called everything from a "diva" to a "whack job," and yet through it all she remains remarkably unphased. In an interview this week on ABC's 20-20, Palin said, "I'm not doin' this for naught." Yet another pithy utterance. Here’s my question to you: If John McCain loses, what’s next for Sarah Palin? 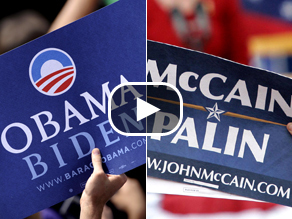 How can McCain win undecided voters? Less than 140 hours until election day when Americans will rush to the polls in what is expected to be record numbers to decide the direction of their country for the next four years. Never has more money been spent by candidates for president to try to convince you they are the answer to America's problems. And yet after almost two years of campaigning, it is estimated that somewhere around seven percent of Americans still have not decided whether they want John McCain or Barack Obama to run things. The differences between the two men are as pronounced as between any two candidates for the nation's highest office in a very long time. Whether he admits it or not, John McCain carries the mantle of President George W. Bush with him–seen as a continuation of the policies that have led to record low approval ratings for our current president. Americans are simply not happy with the way things are going. Yet McCain remains competitive. Barack Obama is seen by many as a transformational figure who offers the country a chance to break with the past. His early campaign theme of change took hold with many of those Americans who are dissatisfied. It would seem that if John McCain has any realistic chance of winning next Tuesday, he must somehow attract a large percentage of those voters who have yet to make up their mind. Here’s my question to you: In the final few days, what can John McCain do to win over undecided voters? How close is the White House race to being over? The signs are increasingly ominous that John McCain's dream of being president is just about over. In one battleground state after another, Barack Obama's lead continues to grow. 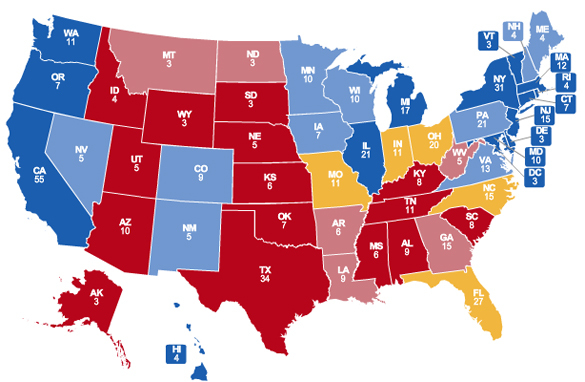 CNN's electoral map has been adjusted to suggest that if the election were held today, Barack Obama would get 291 electoral votes - it takes 270 to win - while John McCain would get just 163 - leaving 84 electoral votes up for grabs. Barack Obama holds substantial leads in Pennsylvania, Nevada, Colorado and Virginia… all red states won by President Bush in 2004. Obama also leads in Florida and North Carolina . The Associated Press quotes GOP consultant Tom Rath in New Hampshire where McCain trails by double digits as saying the race is all but over, quote, "I get the sense it's shutting down," unquote. AP also cites a senior GOP aide in Congress speaking on condition of anonymity as saying McCain advisers are now being asked by some Republican leaders to focus McCain's travel on states with close senate races… essentially abandoning his White House ambitions to help re-elect GOP Senators. Here’s my question to you: How close is the White House race to being over? 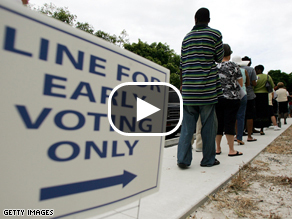 What does record early voting mean for election? Voting booths and tables are filled with early voters at Veterans Memorial Auditorium in Columbus, Ohio. Record early voting is under way in 30 states. Voters are casting their ballots either at the polls or through absentee ballots. In both Georgia and North Carolina for example, an estimated 20 percent of registered voters had already voted as of Monday. In some states, voters have been willing to stand in line for hours while waiting to vote early. This kind of energy and interest is in stark contrast to some past elections where you couldn't get voters out of bed on Election Day to go to the polls. The eight years of the Bush administration has energized our democracy like never before and indications are Republicans aren't going to like the outcome. An estimated 122 million Americans, or about 60 percent of registered voters, voted in the 2004 presidential election, according to the committee for the study of the American electorate. That was a six percent increase from the 2000 election and the highest turnout since 1968. But if new registrations and early voting this year are any indication, this could be an election for the record books. Here’s my question to you: What does record early turnout mean for next Tuesday's election? What does McCain have to do to win? Speaking Sunday on “Meet the Press,” Senator John McCain guaranteed a win in next Tuesday's election. He said, "We're going to win it, and it's going to be tight, and we're going to be up late." However if the polls are anywhere near accurate it was sort of a "Dewey beats Truman" moment. 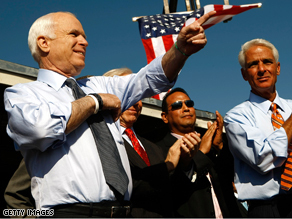 In order to make good on his promise, McCain has some heavy lifting to do in a handful of battleground states. Traditional red states like Virginia and Colorado seem to be slipping away. In Pennsylvania, Obama holds a 10-point lead over McCain, 52 percent to 42 percent according to a new CNN Poll of Polls. Those numbers appear to be holding firm despite furious campaigning by Senator McCain. Obama was ahead by that same margin last week. The McCain camp has called Pennsylvania a must-win state…. McCain has made up some ground in Florida. A new CNN Poll of Polls there shows the race is tightening with Obama now holding a single point lead. Last week, Obama was up by 3 in Florida. 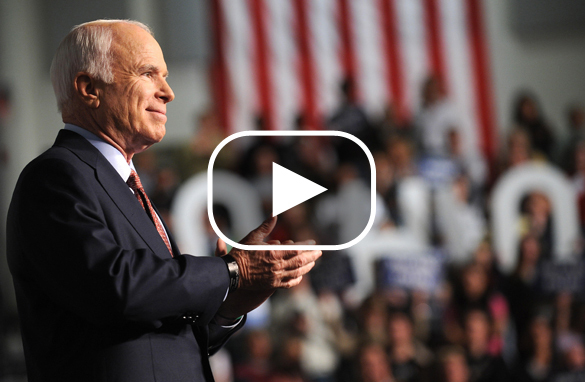 Watch: Cafferty: Can McCain win? But winning Florida won't be enough. He's got to win over North Carolina, Missouri, Ohio, and Nevada too. And that's a pretty tall order with just a week to go. Here’s my question to you: What does John McCain have to do to come from behind and win? What could change your pick for President? 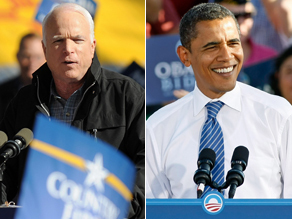 CNN Poll of Polls says 51% are voting for for Obama and 43% say they're voting for McCain. With just a little more than a week to go, most Americans have made up their mind who they're going to vote for on November 4th. According to the latest CNN Poll of Polls, 51 percent say they're voting for Obama. And 43 percent say they're voting for McCain. Six percent of voters say they're still not sure. In battleground states like Florida, Colorado, Missouri and Pennsylvania, anywhere from 92 to 94 percent of the voters say they've already made up their minds for either Obama or McCain. But a lot can happen in a week's time. Especially in this campaign that has been dragged out longer than any other in history and cost much, much more. And it's gotten to be a pretty ugly campaign too, especially on the part of the McCain ticket. ACORN, William Ayers, Jeremiah Wright…The negative attacks didn't win McCain a lot of friends. Most people said they didn't like the nasty stuff. But maybe you never say never. Here’s my question to you: What would change your mind about your vote for President? What effect will the economy have on the election? U.S. stock markets followed overseas markets as the global equities meltdown continues with another sharp decline. Overnight last night stocks fell almost 10% in Tokyo and more than 8% in Hong Kong. European markets didn't fare much better. Investors around the world are becoming more and more convinced that a long, deep recession is beginning. The U.S. economy has lost jobs for nine straight months with no end in sight– more than 760,000 slashed from payrolls so far this year. Another devastating jobs report is likely on November 7, three days after we elect our next president. The housing crisis isn't letting up either. 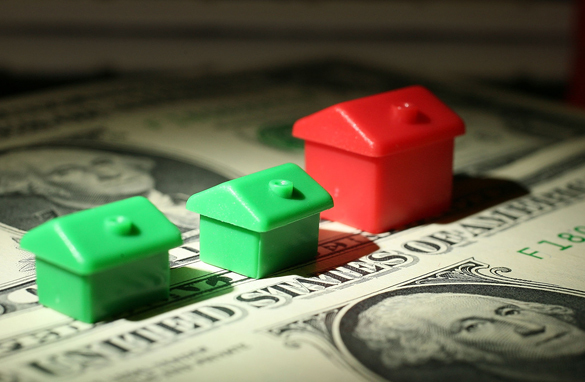 More than 81,000 homes were lost to foreclosure in September alone. There are no signs things are about to get better any time soon…regardless of what happens on Election Night. Here’s my question to you: How much will troubling economic news influence what happens on Election Day? Early voting is under way in more than thirty states. According to some predictions, one-third of the electorate may cast their votes before the polls even open on November 4th. That should ease the burden on Election Day as record turnouts are expected across the country. But not everybody is convinced it will be enough to prevent possible problems. Questions are already surfacing about the accuracy of the vote in Florida and West Virginia and there is an ongoing battle over voter registration fraud in Ohio. There are concerns we may still not have overcome the voting problems that plagued both the 2000 and 2004 presidential elections. A new CNN poll shows that only 58 percent of Americans are confident that votes will be accurately cast and counted this year. And that's worse than the 72 percent who were confident in 2004. And we are the shining example of democracy to the rest of the world. Plus we have been doing this for more than 230 years. Here’s my question to you: What does it mean when the public’s confidence in the integrity of the election continues to decline? Why are so many voters still undecided? After the longest and most expensive presidential campaign in history, 7% of likely voters are still not sure who they're going to vote for. And the election is now less than two weeks away. These are the findings in the latest CNN Poll of Polls. So what's the problem? Maybe if you haven't figured it out by now you should not be allowed to vote. Maybe it's the issues. We've had three presidential debates, one vice presidential debate, one economic meltdown, a $700 billion financial bailout package, a couple of wars and countless arguments about under whose plan you and I would pay more in taxes and for health care. Or maybe it's the mud-slinging…a CNN-Opinion Research Poll found that 3 out of 5 Americans feel the McCain campaign has gone too negative. Another survey by the Associated Press and Knowledge Networks found that negative ads from both candidates aren't convincing the uncommitted–about 60% of undecided voters say the ads make them no more or less likely to vote for John McCain or for Barack Obama. And one-third say they're less likely to vote for either candidate after seeing these negative ads. Here’s my question to you: Why are so many voters undecided so late in the race?